I worked on ‘Urban Worm’ for Friday Night Sew-in. Right off the bat I had some issues.. My tension wasn’t cooperating. At all. So, I mucked about with it, re-setting the top thread tension several times and running some test lines with my walking foot. Running the gamut from setting 0 to setting 9, my top thread tension was too loose. So I decided that Bessie must need a tune-up. So, I opened Bessie’s bobbin casing up and removed shameful amounts of lint. More test lines. No resolution to my tension problem. Okay. Let’s try a new needle. Nada. About ready to pitch Bessie out the window at this point, as I wouldn’t have Saturday to quilt, I had a *facepalm* moment. Re-thread the machine, Jeanne. Always remember to re-thread the machine after making tension changes. That was Dur Moment #1. 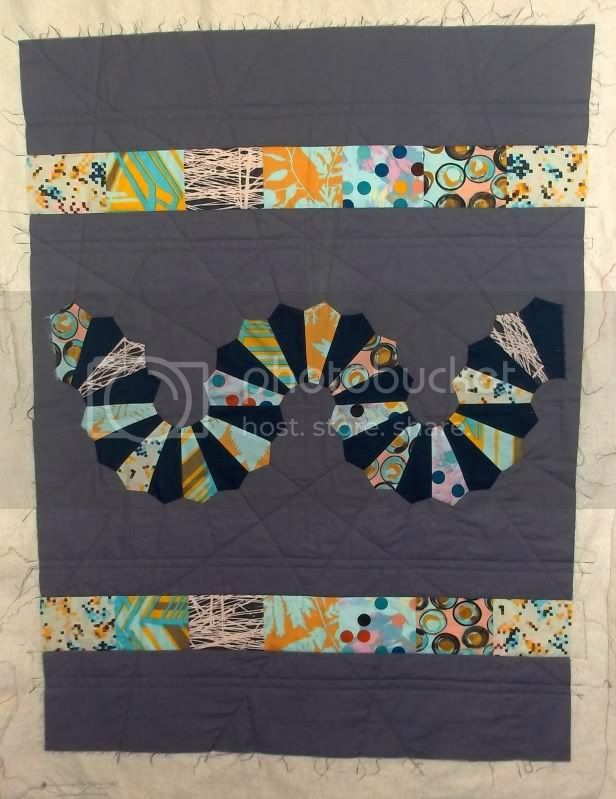 I finished quilting Urban Worm in about an hour and half, after figuring out my tension problem. I was left with a few dozen tails hanging out of the front of my quilt sandwich to bury, because I have decided that I really dislike the look of taking some back-stitches to lock my threads. At which point I taught myself a Quilter’s Knot. A dog’s age ago, when I taught myself to quilt, books mentioned the quilter’s knot and explained how this magical thing was supposed to be done. Unfortunately, the descriptions and diagrams available to me at that time made about as much sense as an engine schematic. My clearly addled seventeen year old self found an alternate and far more time-consuming method of burying and securing my tail ends. Fast forward to Friday Night, when I realized that my method would take forever and would actually mar the look of the finished quilt. Youtube and this video to the rescue. It took a stupid number of tries to get it right and have the motions become muscle memory. And, one must remember that the knot needs to be buried in the layers. If the thread happens to snap before burying said thread, then one will probably have to redo a line of stitching. Yes, that happened. Welcome to Dur Moment #2. I still have to go back and pick that line of stitches out and re-do it. The photo is a little wonky, and I have a lot of excess to trim off. I’m hoping to get the binding done tonight, and then I can spend my commutes over the next week on the hand-quilting. I'm slowly getting around to seeing what everyone accomplished for FNSI! I love your quilt! It's so pretty! Thanks for linking the video, I don't have the knot down either! Awe what a super cute quilt! I also have awarded you with 'The Versatile Blogger Award' over at my blog (http://thepurplequiltapotamus.blogspot.com/). Thanks for being one of the blogs that I love to read! Congrats!